Are you ever overwhelmed? Stressed? Worried that you’re taking too much work home? Do you ever wish you could get more done in less time? It’s no secret that teachers are busy, and there always seems to be more to do than there’s time to do it. But the truth is that there are so many ways to save time – and when we put them all together, it can add up to a much more balanced & less stressful life. I talk about 25 ways to save time in this article here. And one of them is to use keyboard shortcuts. Keyboard shortcuts are combinations of keys to press on your keyboard that accomplish different things. For example, if you hit CTRL+P (Press CTRL and hold it down while you also press P), a screen will pop up that lets you print this page. Will this really save me time? 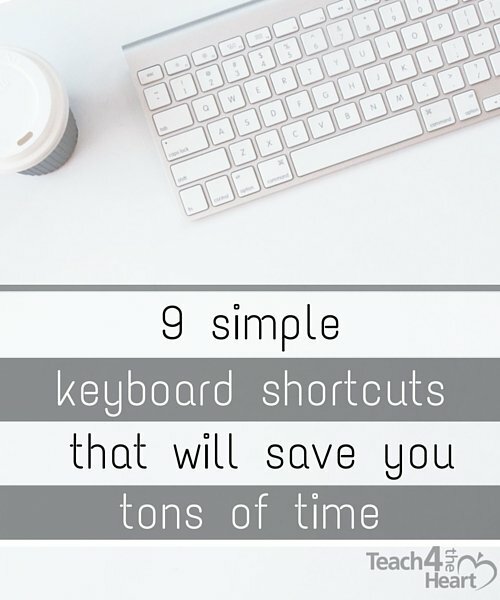 Keyboard shortcuts can save you a TON of time because you can get things done much more quickly when you keep your hands on the keyboard instead of jumping to the mouse, clicking, clicking again. Going back to the keyboard. Going back to the mouse. Clicking. Clicking again. Back to the keyboard. Back to the mouse…..You get the idea. It might not help much at first because you’ll have to stop & think about it. But once you get used to it, you will soon find that your lessons plans took less time to complete, that email was written & sent faster than normal, and printing all your worksheets wasn’t even that big of a deal. 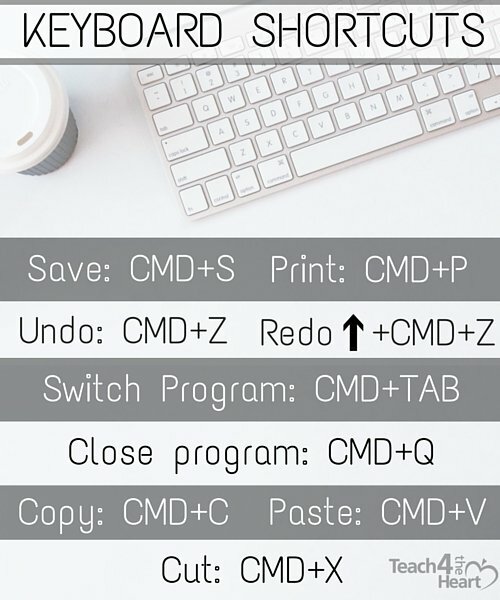 Here are some common keyboard shortcuts to start with. How do I learn these? Print out the cheat sheet above. Start trying them. Open a document and start going through the shortcuts & seeing how they work. Try them each a few times so that you get used to them. Post the cheat sheet somewhere near your computer where you can see it. Enjoy how quickly you can accomplish tasks that used to take so much longer. Do you use keyboard shortcuts? 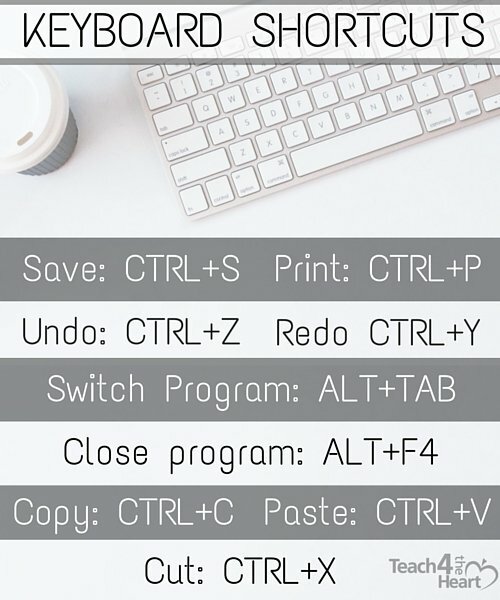 What are your other favorite shortcuts?